Las Médulas is a landscape shaped by Roman gold mining. The mining was done ruina montium, which means that hydraulic power was used to blast the rocks away. The Romans started exploiting the Iberian colony's resources in the second half of the first century AD. The production ended at the beginning of the 3rd century. To be able to generate enough water power, roads, dams and canals had to be constructed. This work was mainly carried out by the Roman army. Water was stored in huge reservoirs, and then transported to the mines via canals. Pressure was created by opening the sluices of the dams at one end of the system. The same water system was used to wash the extensive gold deposits. Inscription of the site by the WHC in 1997 proved to be controversial: the Delegate of Thailand opposed because "he could only consider this site as a result of human destructive activities as well as harmful to the noble cause of environmental promotion and protection." The delegates of Germany and Finland agreed with his position. From the Mirador de Orellan I had my first look at this weird site. It takes a hike of about 800m uphill, through a wonderful green setting with lots of chestnut trees, flowers and berries. 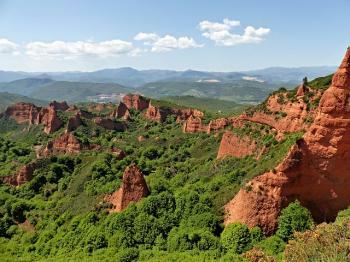 This viewpoint has the classic views, with the red peaks that you usually see on photos of Las Médulas. The mining area looks smaller than I had expected. Later I read somewhere that it is 10 square km. It looks a lot like a landscape made by erosion (like Ischigualasto/Talampaya in Argentinia, or several US National Parks). A drive down of about 10 minutes brought me to the village of Las Médulas. You have to leave your car at the village entrance, only locals are allowed to drive on. To limit damage to the site due to overexposure, only 4 wheel drives are allowed. One of the other reviewers stated that he/she got in with a regular car, maybe that was out of season as today I saw no other way in than to walk (or join a tour). Las Médulas is a rustic village that mostly caters to the quite large number of tourists that pass through, most of them Spanish. Signposts point to several short and longer walks in the area. I opted for a short one: the 3km round-trip to the lake Lago Somido. The quite barren landscape leaves you well exposed to the sun, not to be underestimated at 30 degrees C. However, my walk was short enough. The lake also is a result of the mining (the flooding of a canal). Supposedly several species of frogs and salamanders live here, although I didn't see or hear a thing. Also, no other tourists were on this trail, making it almost a bit eerie to walk around here all by myself. As Las Medulas is located quite far from anywhere, I'd recommend staying overnight. Several of the villages in the area have hotels and guesthouses. This way you'll make it early into the terrain and escape the worst of the heat. The site is large enough to keep you busy for a full day: besides hiking the full circuit (11km), there are guided walks, viewpoints, archaeological remains, visitor centers and plenty of cafés and souvenir shops. I visited this WHS in June 2016. I saw the reddish brown peaks of this Roman mine from quite a distance away while walking the Camino Frances en route to Villafranca del Bierzo. The afternoon light seems to be the best for photography and since quite a bit of walking is involved, this way you'll avoid visiting under the direct scorching sun. So after the Camino and before driving to Lugo, I spent half a day to visit this unique site. First I put Las Medulas in my GPS and surely enough I found a small interpretation centre which focuses both on the cultural as well as the natural aspects of this WHS. Having visited I cannot understand why this is not a mixed WHS. In any case, the interpretation centre provides you with information on what you can visit by car and what you can or have to visit by walk. There are three panoramic viewpoints which are worth visiting if you're not in a hurry: Mirador de Orellan, Mirador de las Pedrices and Mirador de la Frisga. Only the first one can be approached by car and you'll still have to walk 800 metres uphill on a tarmac road. There is ample parking space once you get there but the winding roads to reach this place are quite treacherous for two-way traffic. To reach Mirador de Orellan just input Orellan in your GPS and follow the UNESCO and WH signs. Mirador de las Pedrices is 3.5km further on from Mirador de Orellan and part of the Ruta de los Conventos trail. If you decide to go for this trail you'll also be rewarded with yet another Mirador (de la Frisga) but it is really nothing special when compared to the other miradors. A feature worth noticing is the Canal de Pena Escribida and the information boards with drawings help to understand the complex hydraulic system used by the Romans. The view from Mirador de Orellan is truly breathtaking and definitely the highlight of this WHS. However, if you would like to better understand why this site has been inscribed, I would recommend visiting the Galerias de Orellan which are open every day except on Tuesdays from 11:00 to 14:00 and from 16:00 to 20:00. Here you'll be asked to wear a protective helmet and for 3 euros you'll be able to walk to the "cave" which is visible from Mirador de Orellan. There is little lighting so much so that many bats still live here so keep this in mind if you use flash photography! From here you can also buy some drinks in case you run out of water. After my visit I headed towards the site proper in Las Medulas but honestly you won't gain any more understanding of the site than if you were to visit only the Mirador. 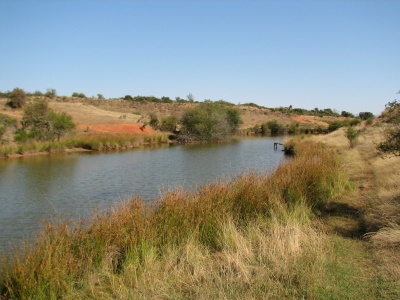 What are worth visiting perhaps are the washeries (now artificial lakes) to visit a different aspect of this old mining heritage: Carucedo and Pozo Somido or Redondo lake. All in all this is one of the industrial heritage sites I enjoyed most and a magnificent site for birdwatching and photography in Europe. We visited Las Medulas in May 2005, but used a car to drive up and around the site. If the weather is dry, a normal car would do, you don't need a 4WD. Using the car gave us a bit more time to look at the site from various different angles and to stroll around. It is absolutely stunning that this moon-like landscape has been created by humans with hardly any heavy tool available to them. From the top you can also see quite a number of little lakes, which are the remains of redirected rivers used to wash out the gold deposits. This is the most amazing site, and the most impressive landscape I have seen. The sheer size of the undertaking defies the imagination when one thinks of the tools available in those far off days. Wear good shoes and take plenty of water, although there is a spring just before you start the last slog up to the Mirador. There is a good small restaurant when you get back down, and it took me about three hours to get to the top and back via the mines. You don't have to go to the top though, just walking through the mines is a visual treat and a great experience. The infrastructure is basic, but that's part of the charm. Entry was free, but the walk through the forrest of giant chestnut trees that have grown over the old mine workings would be well worth paying for. I can only hope that all our abandoned industrial sites will look as beautiful in the distant future. I cannot imagine anyone being disappointed with their visit or leaving Las Medulas without asking themselves some very profound questions about the history of man. Tunnels: At the Mirador de Orallan one can visit an old tunnel dug by the Romans whose technology for extracting the gold from the shale consisted of digging tunnels and feeding in water from canals so as to destabilize the rock until the face collapsed.